This is a great way to cook a turkey and it comes out incredible – moist and tasty! It also frees up your kitchen and oven for other dishes. There are two basic ways to barbecue a turkey: Directly on the grill or on a rotisserie. For this recipe we’ll cook directly on the grill. Try to buy a fresh turkey, not frozen. Fresh turkeys have the best taste and texture. Every little bit of help makes a better turkey in the end! Remove the giblets, rinse the turkey inside and outside and pat dry. Tuck the legs and wings into the turkey and then truss with string so that the wings and legs will stay tight while cooking. You’ll be moving the turkey a few times and you don’t want the bird flapping its legs and wings on the grill! Let the turkey sit at room temperature for an hour before cooking. Brush the whole turkey well with oil. Sprinkle outside and in the cavity with your favorite seasonings – salt, garlic powder, onion powder or a mixed seasoning or dry rub. Do not stuff a turkey you’re cooking on the grill. It would add cooking time and the turkey could get overdone or burned. Instead, cook the stuffing in the empty oven where the turkey would have been! Once the turkey is at room temperature, oiled, seasoned and trussed, we’re ready to barbecue. First, be sure you have enough propane. The turkey will cook for a few hours and you don’t want to run out of fuel halfway through cooking. You’ll be using indirect heat, which means that no direct heat should be allowed to reach the turkey. This is important! Otherwise you’ll have a turkey that is cooked outside and raw inside. Not good. For indirect cooking, light a burner on one side of the grill and place the turkey on the other side. Keep the top of the grill closed while cooking. The more you open the top the longer the turkey will take. Place a pan under the turkey to catch drippings. Place another pan, filled with water, on the grill(not over the lit burner). This adds moisture to the turkey while cooking. Add water to the pan as it evaporates. You’ll want to maintain a cooking temperature around 325º. Use a good oven thermometer. Don’t trust the built-in thermometer on the grill since they are not always accurate. Place the thermometer on the grill next to turkey. Check frequently and adjust the burners as needed to keep the temp around 325º. Figure about 13-15 minutes per pound. If you maintain a consistent 325° temperature the turkey will cook similar to one in an oven. One of the keys to cooking a turkey on the grill is rotation. So, begin cooking the turkey breast side down and legs facing front. After an hour flip the turkey and face the legs to the back of the grill. After another hour turn again so the legs are facing front. This ensures that all parts of the turkey get the same heat throughout. Baste with broth or bullion after each turn. The turkey is done when a thermometer registers 165° in the coldest part of the turkey, usually between the leg and thigh. Digital probe thermometers are accurate and quick. Baste the turkey with broth or bullion frequently. If the skin browns too quickly, cover with aluminum foil. Tuck the foil into the wings or legs so that it doesn’t pull off when flipping or turning. You’re cooking on a barbecue grill, so if you want, get some good smoke flavor into that turkey. If you prefer a straight turkey taste go without the smoke. Either way the turkey is amazingly delicious. For a smoky flavor use wood chips or chunks. You can find them at your local grocery store. Soak several cups of wood (hickory, mesquite, apple, etc) for at least 30 minutes in water. Right before starting the turkey put the wood on the grill. It should be in either a smoker box or wrapped tightly in heavy duty foil with holes punched in the foil. Put it on the grate over the lit burner. Change the wood several times as it burns down and you'll end up with great smoked flavor. Do not open the grill while the wood is smoking. So, there you have it. 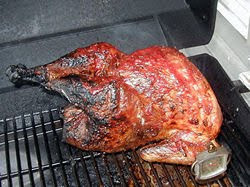 A really delicious, moist and tasty turkey cooked on the grill. Make some gravy and serve with stuffing and cranberry sauce, and you’ll be ready for a feast!